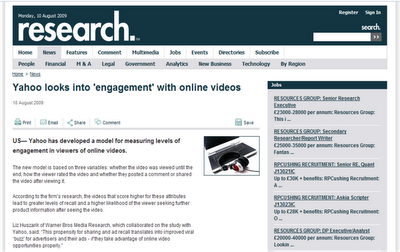 US— Yahoo has developed a model for measuring levels of engagement in viewers of online videos. The new model is based on three variables: whether the video was viewed until the end, how the viewer rated the video and whether they posted a comment or shared the video after viewing it. According to the firm’s research, the videos that score higher for these attributes lead to greater levels of recall and a higher likelihood of the viewer seeking further product information after seeing the video.